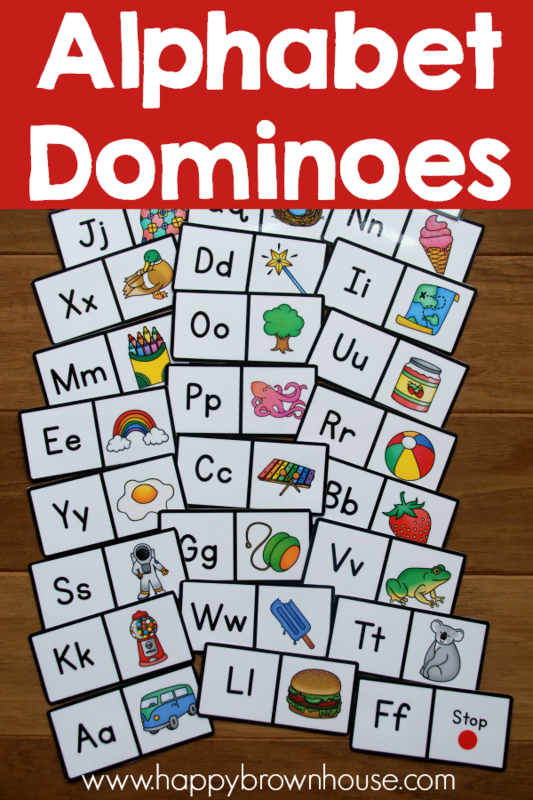 This Alphabet Dominoes Busy Bag is perfect for preschoolers learning to identify and match beginning sounds using pictures and letters. This is a great busy bag idea to use at home or would make a great literacy activity for a kindergarten classroom. The game is easy to play and they’ll be working on important literacy skills at the same time. My preschooler really likes to play this game and line them up all the way across the living room. It takes up some space when all lined up, but it could be modified for a smaller space by making a second or third row. Purchase and download the Alphabet Dominoes printable. Print, laminate and cut the dominoes out. Find the “Start” domino with the green light. Look at the picture on the right side of the domino. Find another domino that has the beginning sound letter and place it next to the first domino. Repeat. When they have matched all the letters and pictures, they will come to the “Stop” domino with a red light. I hope your child enjoys this game as much as we do. 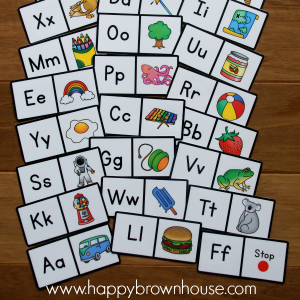 It’s a great alphabet activity for preschoolers or kindergarten kids to learn their beginning letter sounds with a little fun attached. These skills are some of the first steps to reading, so they are important for kids to master. As always, I like to make learning fun and inviting. This game gave my preschooler a physical workout as he went back and forth between the domino line-up and the pile of dominoes waiting to be placed in the correct order. To add some movement with this game, have your child do different types of movements between the domino line and the pile–hopping like a bunny, slithering like a snake, galloping like a horse, or crawling like a bear are all favorites around our house. Of course, this is also a great quiet time activity, too. To help you out, I’ve included an answer key in the download. *Please note: The free period for this printable is over. Oh I really love this! Thank you! What a fun, educational activity! Oh, I love the idea of having start domino, what a great way to get a bit more organized. We just did this today! My son loved it! My only critique is that all the vowel sounds are not short sounds. Unicorn has a long U and Ice cream cone has a long I. You know what, Kari, I didn’t even think about that when I made these. Duh! I should fix that. Thanks for bringing it to my attention. are their two maps in this activity . im confused about one of the pictures. or is their an answer key? One is a quilt. Here’s the order: leaf, hamburger, zoo, unicorn, jam, quilt, nest, ice cream, map, crayons, xylophone, duck, wand, popsicle, octopus, tree, koala, gumball machine, yo-yo, egg, rainbow, ball, strawberry, astronaut, van, frog. Sorry for the confusion! I’ve updated this file with a less confusing picture and an answer key in case you wanted to download it again. My spelling group really really loved these today, but we got a bit confused with some of the pictures and what they are. Is there any chance you could post a photo of the final line of dominoes or even just a list of what each picture is? I’ve add the list to the post, but here is the order: leaf, hamburger, zoo, unicorn, jam, quilt, nest, ice cream, map, crayons, xylophone, duck, wand, popsicle, octopus, tree, koala, gumball machine, yo-yo, egg, rainbow, ball, strawberry, astronaut, van, frog. Sorry for the confusion! Can you show a step by step picture instructions? I’m not sure I totally understand your question. Can you clarify what you mean?